Made from a durable microfiber material, and packed with cleaning power. Instead of gliding over sticky grime, or leaving behind stuff that's crusted on, this advanced pad will lift up and eliminate dirt with ease. It features a combination of slightly different fibers in order to remain gentle on flooring, and tough on dirt. You won't need extra soap, or harsh chemicals to get your kitchen and bathroom clean because the superior fabric will do all of the tough work for you, and with only water as a detergent. It's compatible with any mop brand that it fits on, and it will last for years of regular use because it's totally washable and reusable. Stop struggling with inferior products that force you to sweat and struggle, and start scrubbing without effort. A damp pad and slight pressure will be enough to scrub clean any high traffic area or neglected floor. Use safely on wood, linoleum, tile, marble and more, and never worry about damage. It's ideal for greasy or sticky messes, and it's designed for use on any hard surface. Just get it damp with water to quickly cut through tough build-up, and get your floors super clean. It features a special looped microfiber for increased cleaning power, and the higher quality material will last longer, and clean better than others. High Quality. Better materials result in a more effective pad that is easier to use, but it also allows it to last longer too. Don't waste money on similar looking options that don't work as well. Compatible. The perfect fit for tools that we sell, but also usable on many other brands. If it is similar in size and connection type, you can use it for the tool you have now. Washable. Just wash and reuse over and over again. Unlike throw away alternatives, this one provides much more value for your money. Deep Cleaning. Use wet to scrub any kind of dirt off any kind of floor. Other pads can't remove sticky stuff, but this one can. The gentle action protects flooring while leaving no dirt behind. Eco-Friendly. You don't need toxic liquids to get the floor clean, and you won't have to toss this pad after you finish. When compared to other systems, this one is way better for the environment. Looking to get several pads for your mop? You will receive quantity discounts when you order more than one of the same kind, and you can choose our 4-Pack or 5-Pack to save money when ordering a several types in one order. To see the other 18" mop pads we carry, use the following links: Multipurpose, Polishing, Dusting, Heavy Duty. Good for many years of cleaning fun, these durable pads are totally reusable, and they won't wear out, or lose ability like other ones do. When completely soiled just toss into your washing machine to make them as good as new again. After a light mopping, skip the machine, and just rinse the pad under warm water, and store for later use. After it gets really grimy,throw it in the laundry to thoroughly clean it. Please Note: Never use bleach or fabric softener when washing these pads. Bleach will deteriorate the fibers and fabric softener will clog them. Both of these will not ruin it with a single exposure, but repeated use will lead to decreased performance and a shortened life. 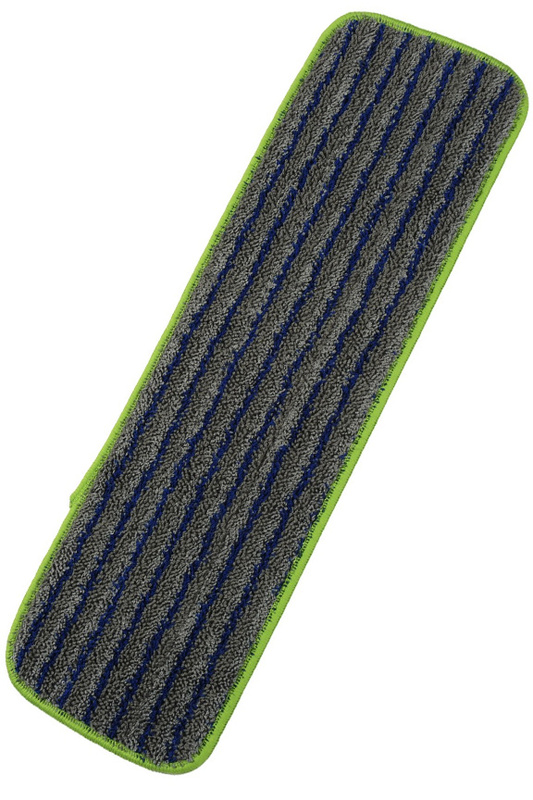 Superior quality, looped microfiber makes this pad unbeatable for scrubbing floors. It's made from top quality material, so your job will be effortless, and it will cut through tough dirt and grime without any struggle. Thanks to the improved fibers, this pad will last a long time, and you can wash it hundreds of times before it needs to be replaced. Intended for wet use, it can gently scrub without any risk of damage to your floors. They are made from a revolutionary material that gives them superior cleaning ability, and each pad is made up of millions of wedge-shaped polyester filaments with cores of nylon. 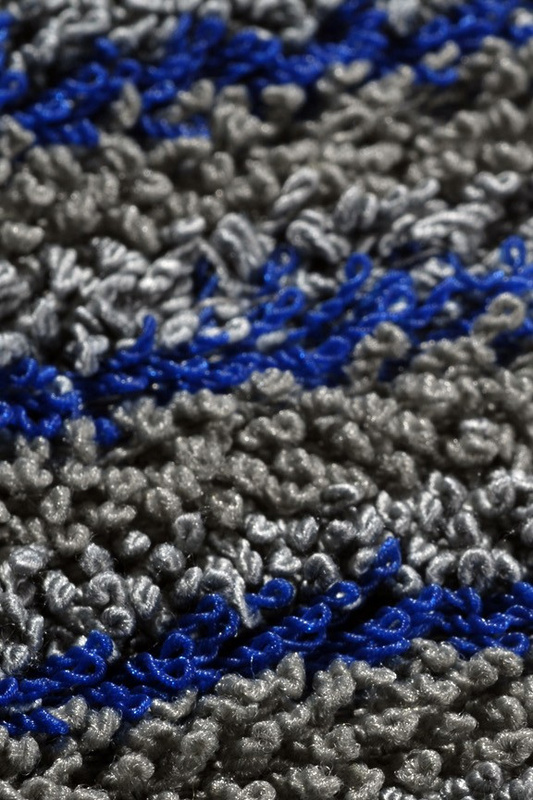 This 80/20 blend of both oil-attracting and water-attracting polymers are woven into masses of tiny hooks & loops. The microscopic ends of each fiber will spread out to skim the surface, cut through dried on stains, and absorb dirt and micro particles. They aren't treated with any chemicals, and you don't need to use chemicals when cleaning with them either. The fabric does all of the work for you. Clean faster, easier, and without chemicals. Only water is needed as a detergent to remove any mess from any floor. 18" Scrubbing Microfiber Mop Pads - To scrub your floor simply wet the removable microfiber mop pad, wring out excess water and proceed to mop your floor or use a spray bottle to add water to mop pad. The pad scrubs so you don't have to. Machine washable hundreds of times. my laminate floors are a heavy traffic area. You walk in from outside and down the hallway. Would I use this mop on a weekly basis without scratching my floors? Yep. Weekly, daily, or hourly, it will not scratch, or ruin your floor, but it will thoroughly clean that high traffic area.